Well, it’s done and dusted for another year. And what an extraordinary year! There were so many great entries that our judges told us what an astonishingly hard time they had getting down to a short list, and then choosing the winners. Thank you all so much for your entries. Without your continued support, MyView would not enjoy the great success it does, so again thank you all so very much! The Rivals was an outstanding entry. Adrian drew inspiration from another somewhat surprising source - an episode of SpongeBob SquarePants “wherein a prehistoric version of SpongeBob and Patrick first discovered fire,” says Adrian. “In that episode, SpongeBob and Patrick are competing over the control to a piece of log which was set on fire due to a lightning. We decided that having two characters competing against each other is a good way of comparing the pros and cons of renewable and non-renewable energy sources”. 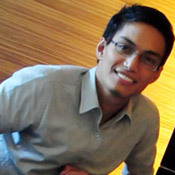 Adrian Sibal, 26, lives in Manila where he works in risk management and financial analysis. Outside of work hours Adrian is vitally interested in “creative thinking and the visual arts. I used to do oil painting. My hobbies are photography and photo and video editing. Together with peers, I am also fond of movies and dream of creating a real one someday. I created quite a number of video presentations for our youth organization”. Adrian is a youth leader and active in his church and in the past four years has been involved in leading advocacy through organizations in his local community. Of his winning entry Adrian says, “We tried to squeeze in a lot of ideas about the pros and cons of renewable and non-renewable energy sources to maximize the 5-minute limitation. [The film] shows that renewable energy sources are at hand, non-renewable energy sources are exhaustible, non-renewable energy sources bring forth pollutants and harm the environment”. “One major aspect which the video emphasizes is that renewable energy implementation requires a significant initial investment but it has far more impact in the long run,” he added. All the judges loved The Rivals’ sense of humor while delivering a strong message. Yeah, I won. Thanks ADB!